Here it is finally...only three weeks late ˚o˚. Oh well, I hope you haven’t given up on checking in! And actually, this still isn't all...the actual recipe should be up by the end of the week. Braises and stews were often looked upon as being “peasant food”, because most of the meat available to them was the less expensive and less tender cuts that require longer cooking times. Not to say that you’re peasants that make this dish, but hey, we all like to find more economical ways to feed our families. If you learn to braise properly, you would have greatly expanded your cooking repertoire. Braising allows you to approach and cook a variety of secondary cuts of meat (shoulder, chuck roast, shank, etc.) that you may have shied away from before. Personally, braising is one of my favorite cooking methods. The meat becomes very tender and rich with the long cooking time which breaks down the collagen and sinew and infuses the meat with the flavors of the liquid you use to braise the meat in. So instead of “peasant food” lets call it “pleasant food”…how’s that? Braising can be done with variety of foods. From meats to fish to vegetables, you name it, it can likely be braised. And of course, the different foods require different cooking times. The trick is to cook the food gently until it is very close to falling apart, to the point where it is difficult to transfer from the pan to the cutting board or plate. Adding vegetables to the braise before it is done makes the finished braise a pretty substantial meal by itself. Heat up some rolls and you have a wonderful satisfying cold weather meal! Another advantage to braising is that it is a great make-ahead meal. Most meat braises are even better the second or third day, allowing more time for the flavors to further coalesce. One of the wonderful things about braises is that they produce a great sauce with minimum extra effort. The sauce could be as simple as just spooning some of the liquid from the finished braise over the meat. Or, if you want to get a little fancier you could reduce it and add some butter. 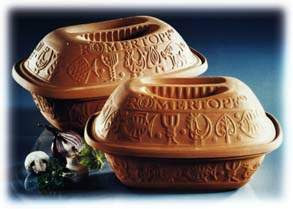 By the way, braises are great to do in a Romertopf, if you have one. They make for a nice rustic presentation too. Braising combines two techniques into one–dry cooking and moist cooking. Brown the food in a sauté pan with some fat. If your pan is not ovenproof, transfer to an ovenproof dish when the food is brown. Add enough of the braising liquid (stock or wine or both) to surround but not cover the food. Bring to a simmer. If you have transferred the food, heat up the liquid in the sauté pan or a separate saucepan then pour it over the food. Increase the oven temperature to 400 ºF. Pour most of the braising liquid out (you may have to remove the meat to do this) and return the meat to the oven for another thirty to forty-five minutes to produce a browned and caramelized crust. While the meat is at this stage it is important to baste it frequently. Strain the braising liquid into a saucepan to make the sauce. Reduce until it is the desired consistency and flavor. 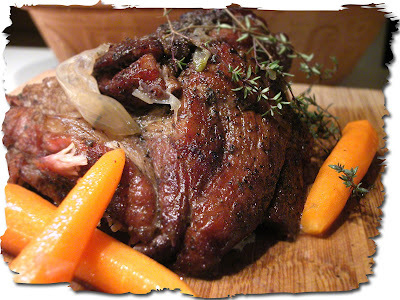 *If using the next day, complete step 3 and let it cool down in the braising liquid. Then transfer to a container with the juices and chill overnight or up to 3 days. When ready to serve perform steps 4 and 5.